Editor(s): Krzesi?ski, J.; Stachowski, G.; Moskalik, P.; Bajan, K.
Every two years, white dwarf researchers and enthusiasts meet to exchange their knowledge and discuss recent developments in white dwarf theory and observations. 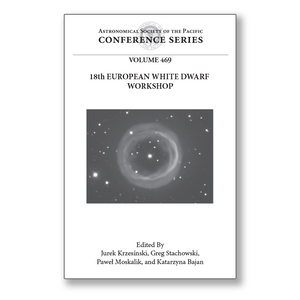 These proceedings are from the 18th European White Dwarf Workshop held at Pedagogical University of Cracow (Krakow, Poland) on 13th - 17th August, 2012. The scientific topics discussed in this Workshop included: pulsating white dwarfs; luminosity function, mass distribution, and populations; white dwarf structure and evolution; white dwarf catalogs and surveys; central stars of planetary nebulae; supernova progenitors; white dwarfs in novae and cataclysmic variables; white dwarfs in detached binaries; physical processes in white dwarfs and magnetic white dwarfs; and discs, dust and planets around white dwarfs. The conference was organized by four institutions: the Polish Astronomical Society, the Astronomy Department of the Pedagogical University of Cracow, the Jagiellonian University Astronomical Observatory, and the Nicolaus Copernicus Astronomical Center of the Polish Academy of Sciences. Altogether, these proceedings include 87 talks and posters presented during the meeting.